We're big pancake fans over here in the Main house. Ok, if I'm completely honest, I'm more of a waffle fan BUT I do love me some pancakes too. Plus, pancakes are a bit easier to make when waffles require preheating a waffle iron and you need to add the perfect amount of batter or else you'll ooze raw batter all down the sides of your iron. Ha! Just me? We frequently make pancake breakfasts about 2 times a week which my husband is more than joyous about! He legitimately expressed many a sad face when I had to switch to a Paleo diet because he was sure that meant the end of his beloved carby delight. WELL! Not true. 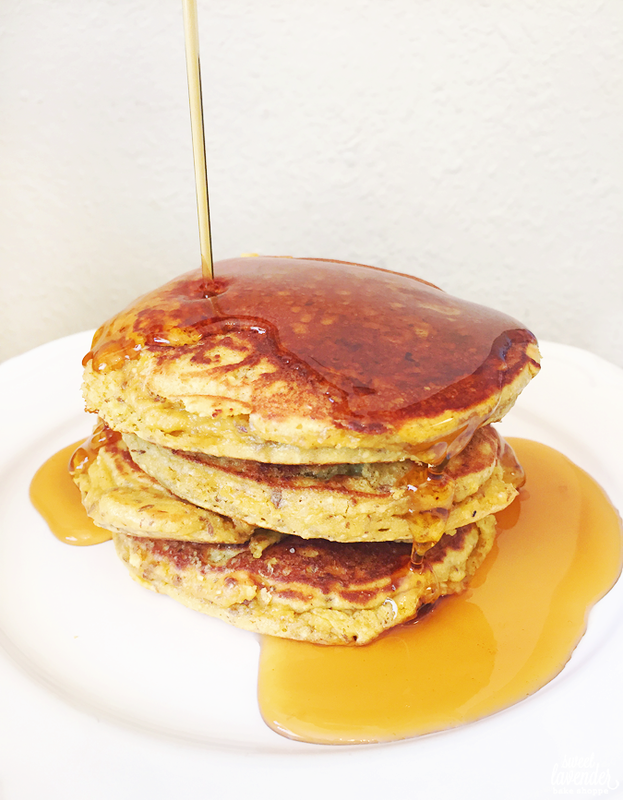 You can make fluffy, delicious and completely nutrient dense pancakes with just a few switcher-oos of the old pancake staples. Flour = nut flour, butter = palm shortening, sugar = honey, etc. Plus I packed in some Vitamin A and C dense pumpkin puree for another vegetable hidden, kiddo friendly food. Because...kids...hate...veggies. At least mine does. 1. In a food processor, add all your ingredients except for the coconut oil. Pulse until batter starts to come together and then process until completely combined. You may need to stop the processor, scrape down the sides and then process again. 2. In a large skillet or griddle, add your coconut oil while preheating pan over medium or medium low heat. Using a 1/4 cup scoop, spoon batter onto preheated skillet. Do not overcrowd pan. 3. Allow pancakes to cook until bubbles start to form and they're browned lightly on the bottom. Flip pancakes carefully and then allow to cook another minute or two until completely cooked through. Remove and transfer to a warmed plate. Continue with remaining batter, adding a bit more coconut oil to pan beforehand. 4. Be careful not to make pancakes too large or they will prove hard to flip and could burn while you wait for the bottom to firm up enough to flip. I found a 1/4 cup was plenty big- you could even spoon them a tad smaller if you wanted. 5. Pancakes are best eaten that day, but can be cooled, and placed in fridge for 24 hours or freezer for a few weeks. Simply reheat in a preheated 350 degree oven until warmed through.